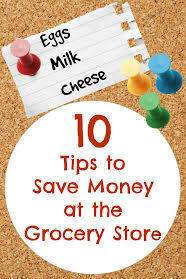 Here are 10 ways to save money on groceries, these tips can help anyone afford the proper amount of food needed at less of a cost. They are helpful in any grocery store and are guaranteed to save the consumer money, which in return will result in a larger amount of food with less money spent.One of the 10 ways to save money is going to stores to get free samples, or ordering some online. As I am sure you are already aware, there are many stores with free samples, some of which are almost as big as a full size product! Many people can find stores with free samples very easily. An easy way to find these samples is by doing a simple web search. Also, places like Costco and Sames Club have food samples outside on most isles during the day, and if you happen to have your toddler with you you can they will quickly fill them up ( free lunch, SCORE!). Free samples can help stock the pantry and they can definitely help with items such as toothpaste and even free laundry soap. Another not so obvious way to some people (but should be if you read my blog!) to save money is by using coupons. Coupons can be collected from news papers, store flyers and much more. Although, there are more coupons online than in print. A shopper can find just as many coupons online as in newspaper inserts or in their grocery store’s weekly flyer. Finding more coupons online is essential for maximizing one’s savings and will be worth the time spent searching in the long run. Some websites even offer clipped coupons at a low cost to be mailed to the customer at a low fee if a printer isn’t accessible. Collecting coupons is a great way (best way in my opinion) to cut down the grocery bill, and if followed correctly get some freebies. Some stores will even double or triple the coupon but be sure to check with the store first because not all stores in every area do it. With a little dedicated time each week to figure costs compared to coupons you will be able to plan your trips according to your budget. Another great money saving tactic is to buy reduced items or on sale items. A bit of planning can go a long way in the grocery store. I rarely if ever pay full price on meat because I literally wait until I find a good stock of 50% off meat and then I buy a large amount and freeze it right away. Not only am I able to get better cuts of meat for a lot less money but I am able to get twice or even three times as much meat than if I paid full price for it. There are more than 10 ways to save money but here are a few more to help. Getting a shopper’s card ( it’s essential, go get them now) may also help decrease the grocery bill, as many stores give discounts to those who have one. Safeway is a big one to have. purchase day old bread or other items that have been marked down due to the expiration date. By buying some goods slightly damaged it will also help reduce the grocery bill. ask a local store if they offer discounts, some stores may offer discounts to seniors or students and also for using your own grocery bags. People can also save money by signing up for a store’s newsletter, people can be sent exclusive offers or other goods just by showing faithfulness to the company or store. buy store brand items, a lot of stores have cheap store brand items that could really help people save money. When they are on clearance they make an even better deal. The drawback to this is that typically you won’t find coupons for store brand. There are loads of ways to save money, be creative and always do some planning and you will be well on your way to saving money even if you choose not to use coupon. Is there something we missed that you wish we would have covered? We will have more 10 ways to save money series very soon so leave a comment telling me what we should include next time.